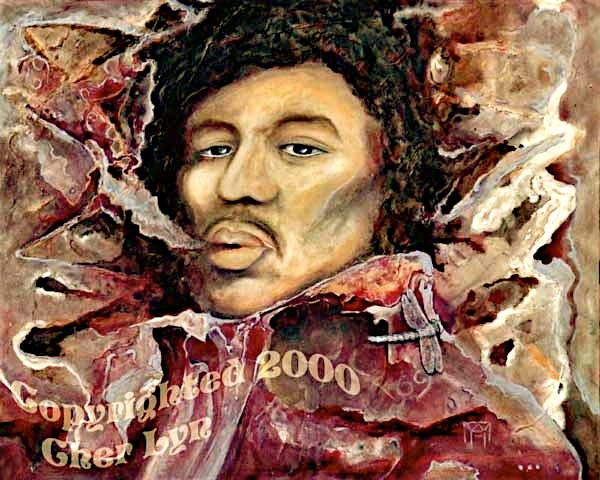 I painted Jimi Hendrix, inspired in his spirit, poety and music... the expression of his soulful imagination. As with any person I paint, my intention was to offer his Spirit light and love for any healing that may want to take place for him in the afterlife. His career and unfortunate death has grouped him with Janis Joplin and Jim Morrison as one of contemporary music's tragic iconic '60s rock stars that suffered said drug-related deaths at age 27 within months of each other, All of them, left stronger legacies in death than they experienced while they were alive performing. Controversies never allowed for solid truths to be revealed about these rock stars deaths, especially suspect around the death of Jimi Hendrix’s. As above referring to all three, I Painted with the intention to offer healing to them in the spirit world... Mojo Rizen, Mother Pearl and “Jimi Hendrix”. I liked that Jimi was an artist who also like to draw as well as make music. He found numerology fascinating, and respectively put 6’s and 9’s laced into the backgrounds of his drawings. I like that he too, like Janis Joplin and Jim Morison, was out spoken, holding honour to his heart, in that time it was dangerous to speak your truth, especially for a black man. I send you light Jimi infinite Electric Light!